In the face of today’s environmental challenges, LPK recognizes Ecological Debt Day—the approximate date each year on which human resource demands exceed the Earth’s ability to supply. Also known as Earth Overshoot Day, the date is calculated by dividing the amount of natural resources generated this year by humanity’s consumption of these resources, multiplied by 365 days. In economic terms, after this date, we are operating in deficit spending. As this date approaches in August 2014, we know we won’t make the black. That’s why LPK created the #GreenItLikeYouMeanIt Pinterest board, which tracks simple ways you can help halt further environmental damage. 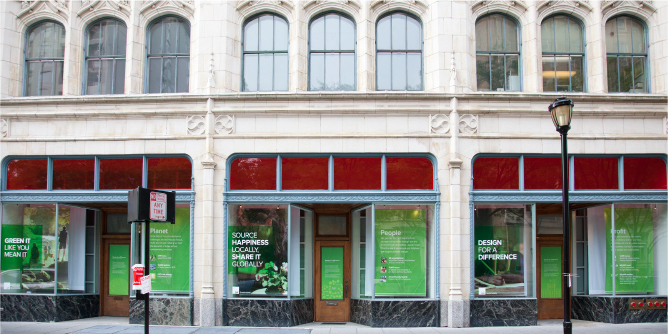 In conjunction with LPK’s 2013 Sustainability Report, our window display also highlights some of the ways we green it like we mean it to support the cause. Check it out, share it and take action to curb our ecological debt.